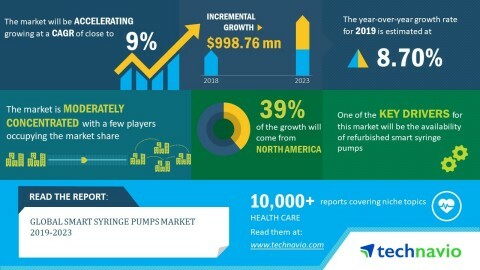 LONDON--(BUSINESS WIRE)--The global smart syringe pumps market is expected to post a CAGR of nearly 9% during the forecast period 2019-2023, according to the latest market research report by Technavio. “The increased adoption of smart syringe pumps in hospitals, specialty clinics, and ASCs has encouraged many vendors to offer more advanced pumps. IRadmed offers 3860+ MRI IV Infusion Pump, which is a non-magnetic infusion pump used to deliver medication throughout the magnetic resonance imaging (MRI) cycle. Similarly, Alaris Syringe module by BD works with Guardrails Suite MX software to deliver precise drug dosage rates. The advent of such technologically advanced smart syringe pumps will fuel the market’s growth”, says an analyst at Technavio.